Gete and her son, Dawit, live in a makeshift hut in Shiro Meda, a slum on the edge of Ethiopia’s sprawling capital city, Addis Ababa. Both have H.I.V., the virus that causes AIDS. Dawit’s father died of the disease five years ago. And though AIDS is not uncommon in Addis Ababa — one in six adults is thought to have it — those who suffer from the disease are stigmatized. Gete cannot use the communal clotheslines to hang her washing, as her neighbors believe — wrongly, of course — that her clothes might spread the disease. Children in the neighborhood will not play with Dawit. But Dawit is not friendless. He is one of 58 children who attend the Shiro Meda Day Care Center, more than half of whom are H.I.V. positive. Here the children receive instruction, have a regular meal and play. Shiro Meda is one of three day care centers run by the Addis Hope Program, which serves over 200 of Addis Ababa’s poorest children. Many are children of women who have been abandoned, raped or, in Gete’s case, widowed. While providing a refuge for preschool children (ages 4 to 7), Addis Hope also trains mothers in entrepreneurial activities. The program was founded in 2001 by Ruth Girmay, a former teacher at the Nativity Cathedral School in Addis Ababa. Helping the less fortunate has been a constant of her life. The daughter of a retired Ministry of Agriculture administrator, she used to give what little spending money she had to beggars outside her church. Ruth, 28, said a dream she had as a teenager about St. Francis of Assisi inspired her to devote her life to helping the less fortunate. At first, she rented a small room to take in 15 children, whose mothers were making ends meet by begging or prostitution. Ruth, a Catholic, then turned to De La Salle Christian Brother Gregory Flynn, who helped solicit funds from donor agencies. Brother Flynn also helped her navigate the bureaucratic hurdles in establishing her program for children. It took two years for the Addis Hope program to receive the proper certification from the government. There is a great need for such programs in Ethiopia, a country of 75 million, half of whom live below the poverty line according to the latest United Nations survey. More than 50 percent of school-age children do not attend school. AIDS accounts for 30 percent of all adult deaths, and two million children have been orphaned because of the disease. 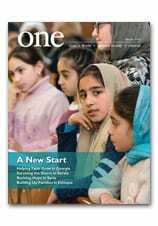 Read more about Addis Hope in the July 2006 issue of ONE.